Now before you all start losing your *Navi*, no this isn't a project of mine... at least anymore. This was a very early on NaNo attempt. This story predates the ending of A Tale of Scorned Souls. 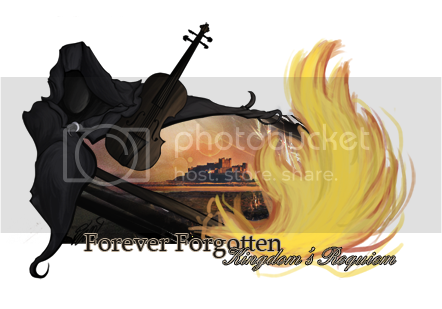 The bit you're reading is the start of a 'prologue' for my completely ZE-ized version of Forever Forgotten. I have toyed with the idea of prequels for the story written just by myself. If these were ever to come to fruition, this would likely be the 'ending' of all the prequels, as it is the last event in Mervil's Crandallian life. This is also a scene you will eventually see as a flashback in either To Dust or Forever Forgotten 3. It explains the last days of Crandallians and what is up with the whole 'haunted/destroyed ship' island you've read about in the chapter called 'The Silver Tower'. YES, I will be finishing this bit, just give it some time . It is also very unedited and lazily put together, so be warned there might be some glaring mistakes. Silent ripples rocked the floating piers in slow rhythmic fashion. No one was out patrolling tonight; the port town of Alvz was all in slumber, quiet and peaceful. Rain was on the dark horizon, a lightning storm was making its way from the Eastern reaches of the Oracle Islands; perhaps the forecast had kept the knights housed up in the guard tower? Either way, he was all alone and happy because of it, gazing at the bulging clouds and the brief flashes of light they owned. This was the only time of day he was able to walk among the streets, the only time he could call the world free. They feared him, they gave him awe and care, uncertain to his existence, but always knowing that someone, or something , was out there. How he missed their company some nights and others loathed it. But in the end he owed them all a heavy duty of care, they were the only ones left… And after they fell to time, life would lose the little meaning it already had trouble keeping. Somewhere nearby a family had forgotten to dampen their clock, it struck at two, ringing out with two chimes to anyone else foolish enough to be awake. Shadows of men moved around in the faint firelight of the watchtower. To its extreme left at the other end of the port was the vacant and decrepit lighthouse. It no longer was acting in service for many reasons, the main being it was too damaged to enter. That would have to be fixed eventually, but if the plans were kept the same, they would all be gone within a month’s time. Mervil sat in absolute silence, the first rumbles of thunder catching at his ears. His long black cloak ruffled in the wind, the frayed ends dangling into the already stirring waters. A torrent was likely to come, blanket them all in a miserable chill and batter down the weakened roofs all around the port. At least the people were used to horrible conditions, being wet or soaked through with brine. But something else was on the wind, a nagging and terrible smell. It was the rank of death, Crandall was rotting and it was the Demon’s fault. Mervil cursed its and his very own existence. So much pain and suffering had been wasted, never to be redeemed to the families gone and the victims skewered with the sharp end of the war. Even the esteemed King had fallen, his own personal guard slaughtered at the Final Siege, Crandall Castle lay in ruins, the bodies of soldiers left to the rats. Before they left, before he tried to make it all a memory, Mervil would tend to many a faction, to set up for the years to go by. But the present was more important, he had learned that the hard way. “Well, it’s your turn for watch.” The gruff and tired voice of a sailor turned knight floated down from the cheerful warmth of the guard tower. His shadow shifted away from the window and another smaller one took its place. What could they have to watch for? They were ants compared to the rest of the dead kingdom, insignificant souls harboured up trying to cower and survive. It was the end of the world to them all, the sea seemed so endless and hope was blanked from their minds every foggy morning. Tonight would test that. Tonight was going to be remembered as one of the worst. Not for the storm, but for the large ship at the end of the eternal horizon. Its sails were black with the clouds, the wet wood of its prow lit up with the sky. The guard did not notice; no one but Mervil did. He hoped they were stragglers who had noticed the large collection of other ships at the port in the distance. If not, he feared the reality. Whoever it was, he had to leave. Mervil tugged tiredly at his beard and brushed his dark hair away from his cool blue eyes. Gods be good, I’m not in the mood to deal with this. Yet, he already knew exactly what it was. Maybe there was some compassion left in their black hearts, maybe they would turn their eyes away. They needed to or punishments would be dealt, cold and relentless ones. Worlds were not alive, people were not conscious, not without the constant reminder of pain. Mervil was its sole deliverer. Jonathan could barely make out the shoreline. These lands across the vast sea were queerly shaped, too flat and rolling, too hilly and without blemish. Stormy nights could spell death to any ship that came across this forsaken country. Was that a lighthouse he saw? No, it was too crookedly formed and shattered near the top. He knew people were there though, small slits of warm light carried across the angry waves from a phallic like structure across the port. “A town? I never would have guessed people could actually live in such a remote corner.” The voice that escaped his lips sounded foreign, unused and sore. What could he expect from being barred to duty high up away from the deck? At least he had not more than five feet to scrub as clean as can be up in the Crow’s Nest. The rest of the crew thought it to be a torturous punishment, but Jonathan found light in being able to watch the stars, not having to overexert himself, not having to smell the bastards below. It was here that he fed a raven that had decided to roost with him the last time they made landfall. The Captain had been trying to find some sort of civilization for almost a month now; ever since they shoved off from their last ‘homeland’ and into the wonderful blue west, there hadn’t been a soul to account for. Greed flowed through him ever since they had spotted this humble abode the day previous. For an instant he had convinced the crew that these lands were untouched and therefore without value beyond letting the walls of Montarg run free and plant inane farmers here. There would be none of that; two days he proclaimed that if another three passed without sightings they would turn around and head back from whence they came. Several islands dotted the path they had taken and many others had taken homes on the horizon all around them, none seemed too interesting as black dots far away. But now, Jonathan could begin to feel the ship shudder with delight. This wasn’t the life he had necessarily chosen, but it was the one thing better than living on the streets. Violence had never been his calling but in this career, violence was the only way to survive. Anyways, I can't WAIT for DP to read here...Teehee.